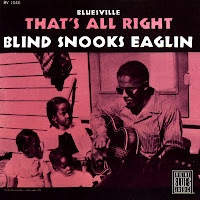 Let me tell you, folks, I just loved Snooks Eaglin. 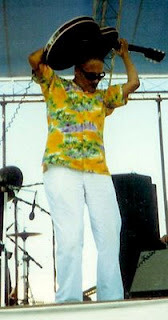 When I was first introduced to him at Jazz Fest back in the eighties, I was completely blown away. A 'guitar player's guitar player', his incredible technique was as revolutionary and uniquely New Orleans as the work Professor Longhair had done on the piano. Blind since early childhood, he taught himself to play sitting there by the radio for hours at a time. By age 11, he was good enough to win a talent contest he had heard about on that radio, and quit school at 14 to try and earn a living as a musician. In 1952, he became a member of a local group called The Flamingoes, along with another talented kid named Allen Toussaint. 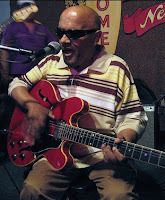 His reputation spread, and in late 1953 he laid down the amazing electric rhythm guitar on Sugar Boy Crawford's Jockomo, the original version of Iko Iko, at a Leonard Chess financed session at J&M studio. 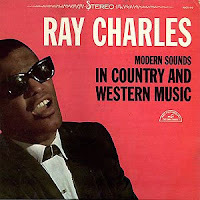 His encyclopedic knowledge of music, and his ability to play virtually any request from the audience, earned him his reputation as a 'human jukebox', and caught the attention of Dr. Harry Oster, a folk and rural blues enthusiast that had done some field recordings up at Angola State Prison. 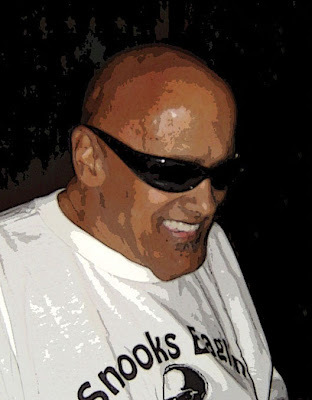 Oster recorded Snooks on several different occasions in the late fifties, and the music from those sessions has been released in different folk-blues packages on various labels over the years. 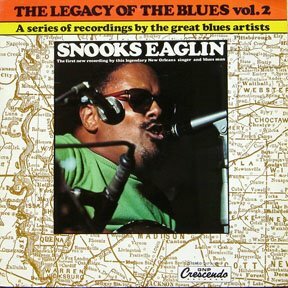 Although those records are great, I think Snooks was kind of giving Oster what he wanted to hear, and that they tended to pigeonhole him as some kind of Deep South acoustic blues figure. He was so much more than that. 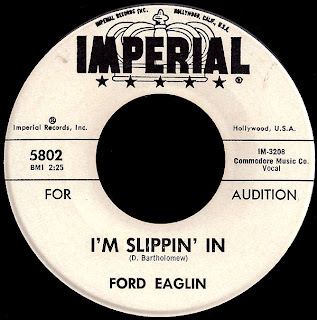 In 1960, Dave Bartholomew got him signed to Imperial, and the ten singles they cut on him over the next couple of years more accurately reflected his talents. This cranking version of a Bartholomew song (taken into the R&B top ten by The Spiders in 1954) just knocks me out. 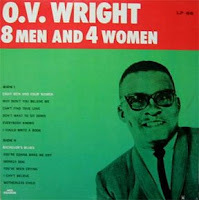 Check out that guitar - then think of the fact that this was released in 1962, and you get an idea of what a trailblazer he was on the instrument. Unfortunately, Bartholomew's sun had kind of set with the label by then, and these Imperial sides went virtually unheard at the time. In 1964, 'Lil Snook' cut a one-off single for Eddie Bo's short-lived Fun label, but nobody heard that one either. 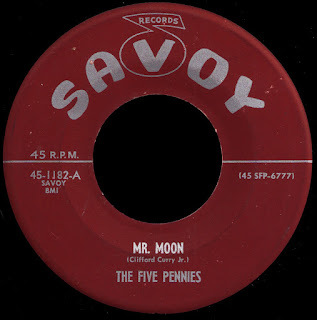 He wouldn't record again until 1971, when Quint Davis, fresh from creating the first Jazz and Heritage Festival, produced an album on him for a Swedish Blues label. 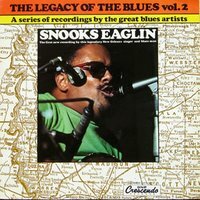 It's a great record but, once again, it featured Snooks accompanying himself on acoustic guitar, reinforcing the idea that he was a country blues man. 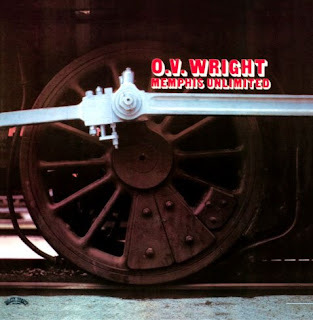 Around the same time, Davis hooked him up with Professor Longhair, and recorded some material that didn't see the light of day until 1987, when it was released as the Grammy winning House Party New Orleans Style by Rounder Records. 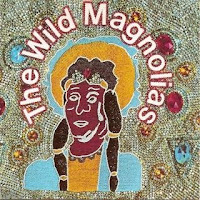 In 1973 Snooks became a part of Willie Tee's New Orleans Project, the group that provided the smokin' funk behind the Wild Magnolias groundbreaking first Mardi Gras Indian LP. The positively jaw-dropping wah-wah pedal that Snooks plays on that record offered a glimpse of his genius, and belied the whole 'street singer' thing that he had been saddled with all those years. His electric guitar would also figure prominently on Down Yonder/Snooks Eaglin Today, an LP produced by Sam Charters in 1977 with an all-star New Orleans line-up. By the 1980s, Snooks had become a perrenial favorite at Jazz Fest and, like I said, his performances had to be seen to be believed. He was signed to Hammond Scott's Black Top label in 1986, and recorded a series of excellent albums that finally began to capture the sheer energy and heart that he put into his work. 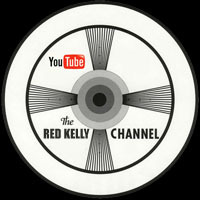 After Black Top went out of business, Scott would produce one more album on him, the funky The Way It Is which was released in 2002. A deeply religious man, he always closed the show with the traditional hymn God Will Take Care Of You. Yes He will, Snooks... may you Rest In Peace. I read the sad news over at Home of The Groove that the one and only Antoinette K-Doe died of a massive heart attack on Mardi Gras Day. 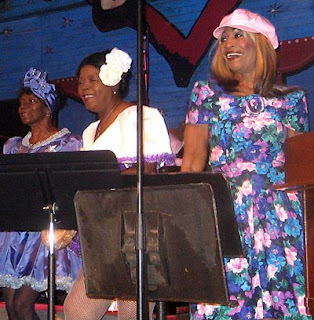 Shown here singing background at the Ponderosa Stomp as the central figure in the Baby Dolls, the Carnival 'walking group' that she helped to revive, she was loved by all who knew her. Her boundless hospitality helped make her Mother-In-Law Lounge the warm and wonderful place that it was, and it's hard to imagine it without her loving touch. 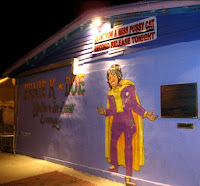 In the wake of the Emperor of the Universe's death, Antoinette had turned the Lounge into a virtual community center, and the outpouring of love that helped rebuild it after Katrina spoke volumes about how this marvelous lady touched the hearts of everyone she met. She waited with me one late night outside the club for my taxi to arrive, even though she had a full house back inside. When I told her that I had seen Ernie perform 'back in the day' she smiled. "He was really something," she said. So were you, Baby Doll, may you Rest In Peace. The loss of these two major personalities within a week of each other has hit New Orleans hard. They will never be replaced. O.V. Wright? You might ask... what is it with this guy and O.V. Wright? Well, if you're a fan of this music (and if you're reading this, it's a safe bet that you are), there is big news. After years of being out of print in this country, O.V. 's Back Beat LPs are being made available on CD for the first time ever! Memphis Unlimited has just been released by Reel Music, the Massachusetts based independent label whose stated mission of "re-issuing some of the greatest soul albums of all time" is music to my ears. 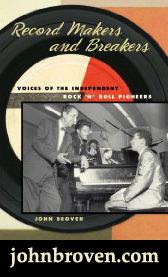 Recent titles by Kim Tolliver and Betty Lavette have been simply sublime, but this one is just over the top. Featuring state of the art 24 bit digital re-mastering from the original analog tapes, and an informative 16 page booklet of liner notes penned by the inimitable John Ridley, I simply cannot recommend this package too highly. You need to buy one. Now, as you may recall, we've been talking a little bit about Royal Studio and Hi Rhythm over the past couple of weeks, and as this album is one of the finest things to ever emanate from 1320 South Lauderdale Street, I figured we'd take a closer look. I'm sure you've all heard the story of how Willie Mitchell kind of took Teenie Hodges 'under his wing' and 'practically raised him' and all of that, which is just wonderful stuff. Well, I spoke with Teenie a couple of weeks ago, and he told me something I never realized. He said he spent hours hanging around the studio as a kid, and that he considers Reggie Young to be his mentor. He said he learned how to play from watching Reggie who, as the guitarist in Bill Black's Combo, was the session guitarist at Royal in those days. Teenie's first appearance on record, he said, was on O.V. 's 8 Men And 4 Women, playing rhythm guitar opposite Young's brilliant lead. Those days meant a lot to him, and he would name his first-born son, Reginald Hodges, after the man who taught him so much. 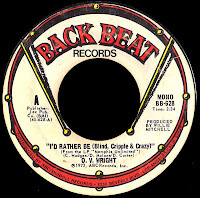 Released in March of 1968, Willie Mitchell's top ten R&B hit Soul Serenade featured Teenie's guitar front and center, and represented the beginning of the new era at the studio. 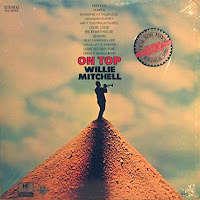 On the strength of that record, 'The Willie Mitchell Group' was selected as the '#1 Instrumental Band' of the year in the annual Cashbox Reader poll, and Willie's next album, On Top, made prominent mention of that fact. The single released from that album, 30-60-90, was a hard hitting workout that would break into the R&B top 40 in January of 1969, and offer a glimpse of what was to come. 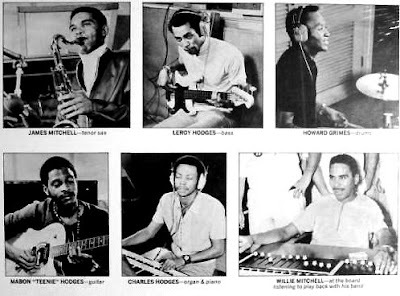 In these awesome photos from the back of that album cover, here's The Willie Mitchell Group as it existed at that point. As we discussed before, the group was involved in an accident in which Willie's brother James was sent flying through the windshield, while the van he was driving rolled over again and again out on some lonesome stretch of highway down in Texas. Miraculously, the band would perform that night, with the worst of their injuries being Willie's broken ankle. According to Howard Grimes, by the time they got back to Memphis, news of the accident was being broadcast on WDIA, erroneously reporting that they had all been killed. In light of what had just happened with Otis Redding and The Bar-Kays a few months earlier, it was an easy decision to come in off the road for good. With Reggie Young and Bobby Emmons moving on to work with Chips Moman at American, Willie's group became the 'house band' at the studio. After becoming part owner of the label, Willie then set out on a conscious mission to transform it from the 'Home of the Instrumental' to the hit factory it would become. He wanted vocalists, and signed a young singer named Ann Peebles after Bowlegs Miller brought her in to audition one day in 1969. It took him a little while longer to sign Al Green, but once he did, all the elements were in place. With his brother James proving to be an excellent arranger (and not only of the horn charts but the strings as well), and those incredible background vocals provided by Rhodes, Chalmers & Rhodes, Willie Mitchell had pulled it all together. By 1971 'the Hi Sound' was the new and unmistakeable 'Sound of Memphis'. As the first O.V. 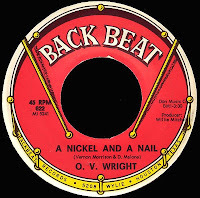 Wright record to feature that fully realized sound, A Nickel And A Nail stormed into the R&B top twenty in the summer of 1971, sandwiched between Al Green's Tired Of Being Alone and the aforementioned monster Let's Stay Together. After that things really started to take off, and by the time O.V. returned to the studio to record Memphis Unlimited in late 1972, the place was just on fire. 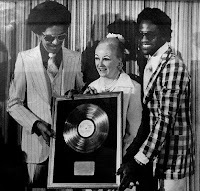 Singles by new Hi artists like Otis Clay, George Jackson and Syl Johnson had joined Green's on the charts, not to mention the work Willie was doing for other labels on folks like Denise LaSalle, Bill Coday and The Detroit Emeralds. 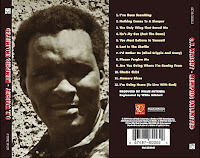 This great selection we have here today was the opening track on the album, and saw release as O.V. 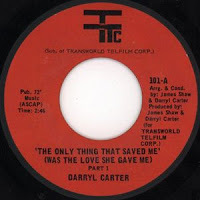 's second single from those sessions, climbing to #62 R&B in the summer of 1974. 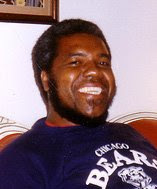 Written by another key figure in Willie Mitchell's universe, songwriter Earl Randle would compose some of Hi's best material, including two other cuts on the LP, Nothing Comes To A Sleeper and the great Lost In The Shuffle (he would also be the man behind Into Something (Can't Shake Loose) a few years later). He and O.V. were hanging out on South Lauderdale Street in front of the studio during the sessions, he told me, and were shooting the breeze back and forth, when one of them said something like "I'd rather be Blind, Crippled and Crazy than to ever do that again..." Carter recalls telling O.V. "There's a song title right there..." and they went back into the studio and found Charles Hodges sitting at the organ. "We wrote that song together, the three of us, in about 25 or 30 minutes," Darryl said, "and we cut it that same day." 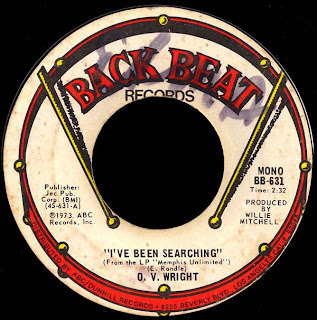 It was, of course, the first single pulled from the album, which broke into the R&B top forty in early 1974, and remains one of the enduring classics of seventies Memphis Soul. Memphis Unlimited is a stunning snapshot of O.V. Wright, Willie Mitchell, Hi Rhythm and the rest of the Royal Studio crew at the absolute top of their game. I can't say enough about how great a record I think it is. Thanks to Paul Williams at Reel Music, this lovingly restored (and reasonably priced) package is finally available here in the 'digital age'. You owe it to yourself to pick one up. 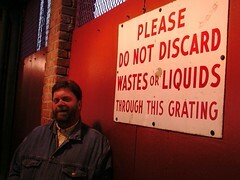 ...and, by the way, if you were unable to make it to Memphis last November for the O.V. Wright Memorial Weekend, this year's Ponderosa Stomp is offering you a second chance. That's right, Hi Rhythm, Otis Clay, and Roosevelt Jamison are all scheduled to appear down in New Orleans this April in what is shaping up to be an amazing few days of Soul. Tickets are now available. One of the truly great horn sections of our time was anchored by three incredible saxophone players, who passed on within days of each other last month. 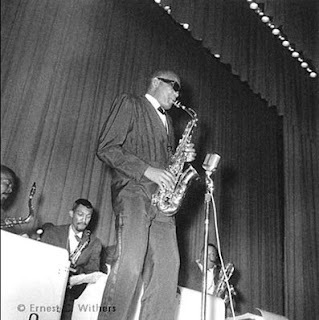 Brother Ray believed in the power of the instrument, and by 1959 he had put together the winning combination of Fathead Newman on tenor, Hank Crawford on alto and Hog Cooper on baritone (pictured left to right behind him in the Ernest Withers photograph above) that would be heard on so many elemental and influential hit records. One of my all-time favorite songs, this smoldering version of a traditional folk tune was released as the flip of the great You Don't Know Me as the second single pulled from the ground-breaking Modern Sounds In Country and Western Music in July of 1962. Both sides hit the charts, and it was that phenomenal album that put Charles and his band squarely in the public eye and began his long reign as one of the most-loved figures in American music. 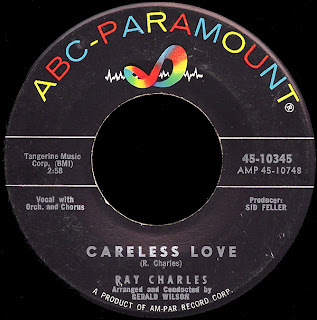 Whether it was a gently building groundswell like you're listening to now, or the blistering funk of songs like Unchain My Heart, these brilliant sax men played such a huge part in creating Ray's signature sound. All of them would go on to have impressive careers of their own, but the time they spent working together behind The Genius of Soul may well be remembered best of all.